Cartoon animals may drum up hilarious antics, but millions of real-life cats and dogs have learned to love (or at least respect) one another. Perhaps that’s why millions of pet owners feel their house isn’t complete until they’ve added a puppy and a feline to the family. It’s easy, as long as you stick to a few steps. Under no circumstances should you “let them work out things on their own.” That method is far too stressful, even in the best of circumstances. 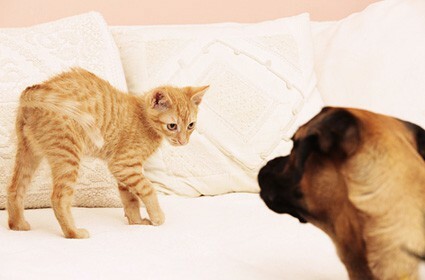 It’s important to keep in mind that introductions can be dangerous, especially for the cat. Some dogs see cats as prey, and even those who are generally easygoing may react instinctively to a feline on the run. Introductions must be supervised and handled with planning, care and patience. If you have a cat and are going to bring in a dog, try to find an animal that is familiar with cats. 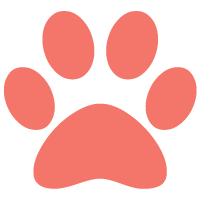 Shelters, rescue groups or private parties looking to place puppies and dogs often know whether an animal has successfully lived with one. If you have a dog and are planning to bring in a cat, start working on Fido’s obedience before you add the new animal. 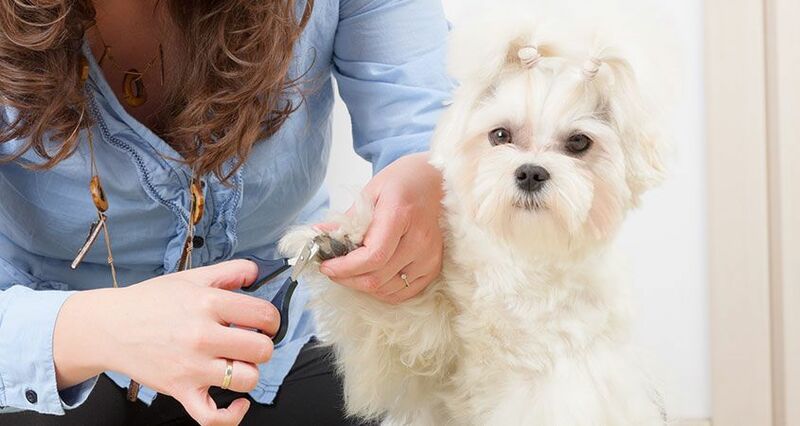 Your dog should be comfortable on a leash and trained to mind your requests for him to stay in either a “sit” or “down” position while on that leash. For the cat’s comfort, he should be confined to a small area during the early stages of introductions. A second bathroom or guest bedroom will offer the cat a safe space while acclimating to the dog’s sounds and smells. Be sure the room has everything he needs (including food and water bowls and a litterbox and that he has frequent one-on-one visits with human members of the family. After the cat has been sequestered for a few days, you can begin the introductions. Put the dog on leash and open the door to the room. Allow the animals to see one another, but do not let the dog chase the cat, even in play. Use “sit-stay” or “down-stay” to keep the dog in place while the cat gets used to his presence. Don’t force the cat to interact with the dog; if the cat wishes to watch him from the darkest recesses of the bed, so be it. Reward both animals with treats and praise. Keep the dog on leash for a couple of weeks in the cat’s presence. You should always make sure the cat has a way to escape from the dog — baby gates are especially effective. Build up the time the animals spend together, and continue to make the introductions rewarding with more treats and praise. When can you take off the leash and let the two begin their lives together? When the dog isn’t interested in bothering the cat and the cat feels secure enough to come out from under the bed. How long it will take to get to this step will depend on the animals involved, and you must work at their pace.